What is the Fittest Sport? Below are my top 10 sports considered I consdier to be among the highest in fitness requirements. This is just personal opinion - there have been other attempts to more accurately determine the world's fittest sports - such as my calculation and via online ratings of fitness components. The results of a few sports comparisons, testing and analysis came up with the sports of boxing, skiing and squash as the owners of the title of the World's Fittest Sport. It could be argued that many other sports are also worthy of the title. I'll let you make up your own mind. See the competition to determine the World's Fittest Sport. You can't go past boxing as the sport requiring the greatest all round levels of fitness. Aerobic endurance, strength, power, speed, agility and flexibility are all extremely important for success in boxing. I would make sure I was extremely fit too if I had to get in a ring with someone who wanted to bash me up. The Decathlon is not a sport as such, but an event in Track and Field, though there is no doubt that the event requires the ultimate all round athlete. The decathlon comprises 10 events performed over two days: 100 meters, Long Jump, Shot Put, High Jump, 400 meters, 110 meter hurdles, Discus, Pole Vault, Javelin, 1500m. No wonder the Olympic decathlon champions are often given the title of the World's fittest athlete. Are decathletes the best athletes in the world? Whether it is field hockey or ice hockey, this team sport requires speed, power and agility, with a very good level of endurance. I rank both hockey versions here the same, though in ice hockey I would think that strength and power are more important, and in field hockey, played on a larger field requires higher endurance levels. Anyone who has watched some AFL football would agree that of all the football codes this is definitely the one with the greatest all round fitness requirements. With no protection, and the play going on all around them, players need to be quick and agile, strong in the tackle, and keep doing it for hours. If fitness was defined as endurance fitness, cross-country skiing would be expected to come out on top easily. A new section of the Topend Sports website lists the world best performances in many of the common fitness tests. In the VO2max category, cross-country skiers are highly represented on the top of the list. 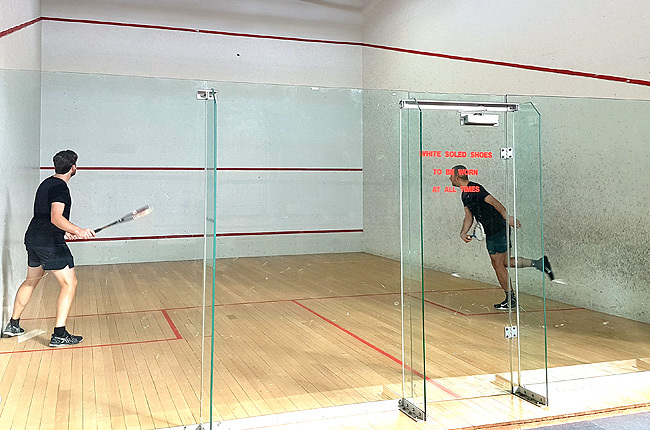 Squash is played in a confined space, but that does not restrict the movements of the players, who require superior fitness to quickly cover all parts of the court in this non-stop game. Invented by the American Indians, speed and agility are not enough in this sport. Going by the protective gear that they wear, it is also a very hard played sport requiring good strength and power. Gone are the days where skill only would enable you to reach the top in world tennis. Recent players with great fitness levels have dominated the game, with strong powerful strokes, and the speed and agility to cover all of the court, and the endurance to make it though sometimes hours of play. American football is a sport that requires players with high levels of fitness in the range of components, though specialist positions mean that some players can concentrate on one area such as speed or power, creating superior linesmen, wide receivers or kickers with unique physical characteristics. The Ironman is a long distance triathlon, comprising (raced in order with no break) 2.4 miles (3.86 km) swim, 112 miles (180.25 km) cycle, and finishing with a marathon run (26 miles 385 yards, 42.195 km). If fitness is defined by endurance and determination, then Ironman triathlon is the one. POLL: What do you think is the world's fittest sport? See also about the Fittest Athletes. who is the World's Greatest Athlete? vote for the Greatest Athlete of All Time? Is motocross the most demanding sport? MENS GYMNASTICS is above all else and those who aren't gymnasts have no idea and should not deny it! I know who on earth put this list together gymnastics and running (cross country) are the most fit sports. I'd like to see who ever made this list try doing all the conditioning and energy and endurance in gymnastics an see you run hard for a long time. Gymnastics is a very intense sport. with all the conditioning and fast and energetic movements with a minimum of 3 hour practice. Conditioning is really hard an we usually do lots of cardio workouts to. To be honest cycling is a dodle I do boxing lol boxing fitter then footballers and cyclers and running (Sprinting). Boxing is the fittest sport out there better then football because you take hits but not football. Cross fit, mimics a boxing/mma routine ... That's why it works (from Josh, July 2012). - Rowing - Where do I start with rowing? Rowing pushes all the key muscles in the body to exhaustion [when done correctly]!! A definite top of the list. - Cycling - Tour De France [enough said!]. - Swimming - yet again pushing all the muscles to the limit. - Boxing - a wide variety of fitness components required. - Marathons or Ironman events - very fit people!! yall are crazy, GYMNAST are stronger than any football player or boxer (from c, Jan 2012). I think you need much better fitness to fight in MMA than in boxing. What about motocross? (from Tinman24 (Apr 2011). basketball is 2nd squash is 1st! This website is rubbish! (from paolo, April 2011). I think its horse riding if u own a horse its a lot of work i have 13 and ride them all u have to muck them out lift water buckets and muck out,empty wheel barrows and riding taker over a hour and walking up and down the hill to catch your horse (from chloe, April 2011).